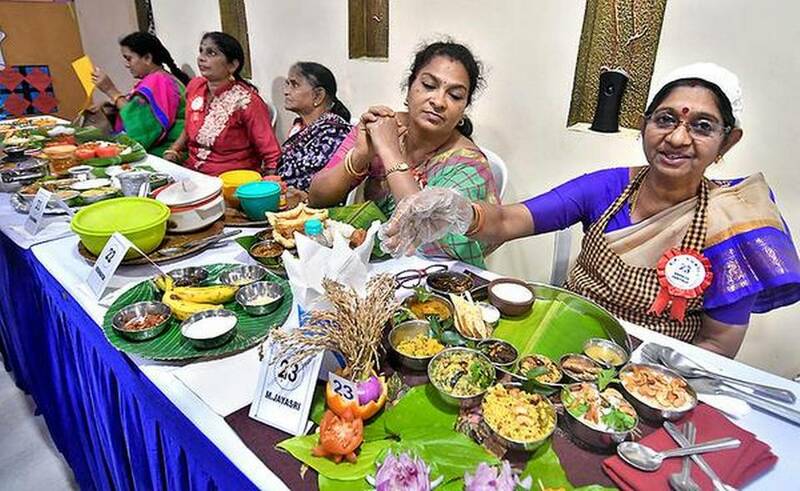 A cookery contest ‘Andhra vantalu – Best Andhra Thali’, organised by Andhra Pradesh Tourism Authority (APTA) in association with the Southern International Hotel Management Academy (SIHMA), drew good response, at the academy premises at Isukathota, here, on Friday. The concept design with flowers and plants, made from biodegradable materials, provided a neat ambience at the venue. A majority of the 100 participants were homemakers, while a few were students. The contestants prepared the dishes at home and presented them at the venue. They awaited the arrival of the judges, chefs from Mariott and Dolphin hotels, to taste and evaluate their dishes. The participants were allowed to present a minimum of five and maximum of 10 dishes, both vegetarian and non-vegetarian. The competition was intended to provide authentic and traditional dishes at one place and to showcase the rich blend of Andhra cuisine. The competition was inaugurated by the Regional Director of Tourism Radhakrishna Murthy and Head of the Department of Food Sciences and Nutrition, Andhra University, V. Lakshmi Kalpana. Assistant Director (cuisine), AP Tourism Nissar Ahmed and District Tourism Officer Purnima Devi, CMD of SIHM Academy Satish Ponnam and its ED Swapna Ponnam were present. “Tourists crave to relish authentic delicacies on visit to new destinations. There is also a growing health consciousness among them. Millets have become extremely popular and are much sought after due to their health benefits. Competitions like these can help them in learning how millets could be used in the preparation of dishes for breakfast, lunch and dinner,” Mr. Radhakrishna Murthy said. “We had received over 200 calls seeking entry for participation,” Mr. Satish said. P. Manjari, B. Rekha and M. Jayasri bagged the first (₹5,000), second (₹3,000) and third (₹2,000) prizes respectively.